Well I did go upto my studio and make one card. I made tons of flower soft. Flower soft looks so nice but is so expensive - just a little jar costs about 7 dollars. Well we can get the same effect by just buying styrofoam shapes like ball etc available so cheap at local craft store . So basically for a dollar or two you can make well about 40 jars I think depending on your inclination. I had it at home as we use different shapes for modeling and drawing ie observing the shadow and light on the white shapes. You need white shapes so that you can color. Just rub them together and they powder up. I just added some ink. You can use alcohol ink or re-inker or copic filler anything even acrylic paint but the more liquid and less thicker - the better. Inker or alcohol ink bottles are best. I just took a plastic sheet - ziploc and then rubbed and added two or three drops of color and used a palette knife to mix. you can use chopstick or anything but the metal or plastic palette knife is best as you can crush lift scoop and mix easily with this as basically that's what this flexibe knife is meant for and well. I have tons of it. The tree is from disney happily ever after. I cut two same size and one I added in the back and then placed the panel and marked the other tree so I could cut the portions protruding from the panel. 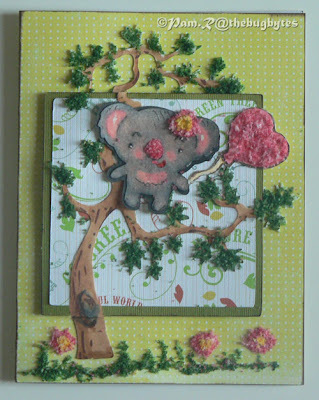 I cut all the pieces - the sentiment , koala bear, tree all in biege or sandalwood color paper - a neutral color. Then used copic marker to color. The sentiment too was done using copic marker for the base and then stamped a flourish. I then added green, pink and yellow flower soft substitute that I had made. The heart was first done with pink and I did not like it so I added directly some ink drops on the flower soft directly. I first glued the lower uncut tree and then pop darted the panel (after inking the edges). I of course did not add flower soft to those portion which goes under the panel. Then I carefully placed the cut tree ( also colored and flower softed - what a term !! !- well if adding glitter is glittered then adding flower soft is flower softed lol) aligning it. Then free handed the grass with glue and added flower soft and then added some flower shapes - one for the hair adornment and some for the grass. Well.. That was about it. I added some to the balloon and felt the nose needed some too so added to it too. 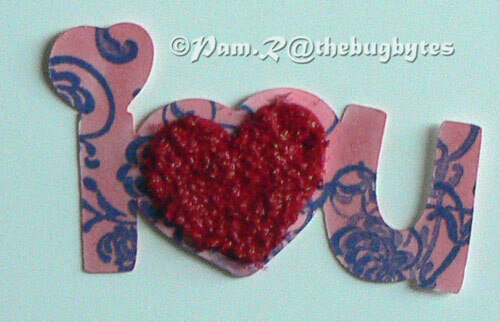 what a cute card....isn't great you can make your own? Wow... great idea... I never would have thought of that!! Thanks for the tip!! Your card is adorable!! Wow! I didn't know you could make your own flower soft! Great tip! and great card! I am soooooo happy now I can once again comment on your BEAUTIFUL PROJECTS! This is a wonderful card so detailed. I am soooo sorry that you are going through this frustrating time. So cute!!! I love Koala! Love your card. It is so adorable.